Colorful wooden spheres, cubes, and cylinders provide plenty of patterning practice, a prerequisite for early reading and math activities. Basic Concepts – Colors, counting, and learning about similarities and differences are all a part of pattern play. 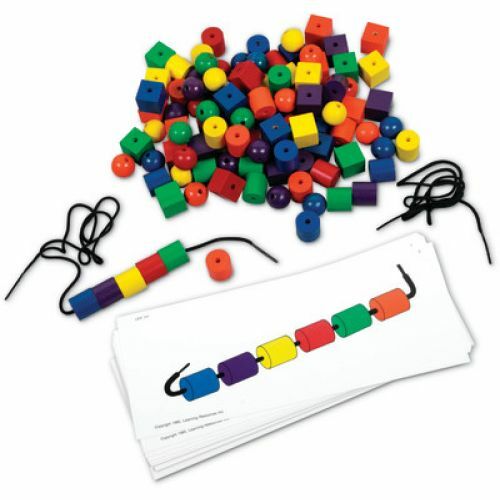 Work together with students to group the beads in different piles by color or shape. Then begin to create patterns to help students identify the different attributes and recognize what comes next. 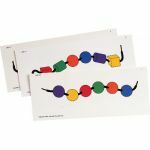 Math –As students bead a repeating sequence of colors and shapes, they are creating AB patterning (e.g. red, blue, red, blue). Through patterning, students are beginning to recognize order and predictability. Add to the fun by counting the beads as they are laced in place. 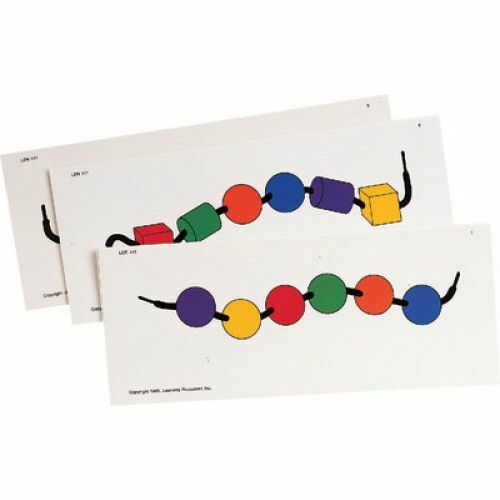 Fine Motor – Picking up the individual beads uses pincer grasp and strengthens the muscles in the hand needed to write and perform daily living skills, like getting dressed and brushing teeth. Using two hands to play by holding the lace steady with one hand and picking up and placing the beads on with the other helps develop the ability to use hands cooperatively.